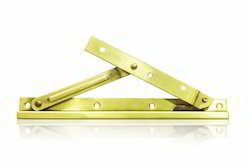 Pioneers in the industry, we offer wooden window brass stay and brass friction hinges from India. 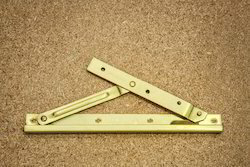 Wooden Window Brass Stay are designed to make the cleaning of outside windows safer and easier. With no awkward catches or buttons the simple action of opening the window to 90 degrees releases both top and bottom mechanisms. While cleaning the window the hinge remains safe and stable due to a design feature that locks the two sliding mechanisms. It is manufactured from hard wearing stainless steel and has excellent load bearing characteristics. The friction slide is made from high strength glass-filled nylon and fitted with an adjustable brass resistance screw. The product is produced in 13mm and 16mm stack heights and can be fitted to windows up to a maximum size of 700mm wide by 1300mm high. Windows can be easily extended using our ‘soft press button’ mechanism for emergency exit requirements. Manufactured from 430 ferritic stainless steel, they are tested to 25,000 cycles for longevity. Heavy duty hinge with adjustable friction. Also available are hinges with fixed friction. Fits 1-3/4 minimum sash thickness. For 1-3/8" thick there is a different, narrower size. For windows of a reasonable width. If the window sags when it is open, the window is too wide for these hinges. Hinge length should be at least 80% of the height of the sash. For awning, hopper or transom windows. There is a different style for casement windows. Sold by the set. Order one and you will get a left hinge and a right hinge. These are solid brass hinges. Zinc plated steel hinges are also available. Looking for Brass Friction Hinges ?